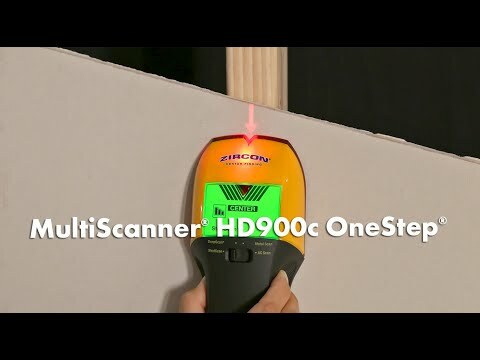 MultiScanner® HD900c OneStep® multifunction stud finder locates studs, metal, and live AC electrical wiring behind walls, floors, and ceilings. The advanced ColorTrip™ display lights green in stud scan, blue in metal, and red in live AC scan modes. Screen flashes, or lights, red to alert the presence of live AC in Stud, DeepScan®, and Metal Scan modes. A 4-mode switch makes it easy to change modes, while the ultra-bright display screen, SpotLite® Pointer, and audio tone all indicate the location of the target.